Students learn the rules of the new game, "Aerial AssistSM" at the FIRST Robotics season kickoff, held at Stony Brook University's Jacob Javits Lecture Center on January 4. More than 800 teenagers from Long Island and metropolitan New York-area schools converged at the Jacob Javits Lecture Center at Stony Brook University on January 4 for a local kickoff of the FIRST (For Inspiration and Recognition of Science and Technology) Robotics Competition (FRC) where they learned details of the 2014 robotics game called "Aerial AssistSM." "The students who participate in the FIRST Robotics Competition are not only building robots; they are building character, self-respect, and relationships with their peers," said Dean Kamen, president of DEKA Research & Development and FIRST Founder, adding, "Winning the game is fun, but the importance of FIRST is that you'll get much more out of it than you put in, and it's going to change the rest of your life." The 2014 game, "Aerial AssistSM," is played by two Alliances of three teams each. Alliances compete by trying to score as many balls in goals as possible during a two-minute and 30-second match. Additional points are earned by robots working together to score goals, and by throwing and catching balls over a truss suspended just over five feet above the floor as they move the ball down the field. After learning the rules and being shown the playing field, teams received a Kit of Parts made up of motors, batteries, a control system, a PC, and a mix of automation components – and only limited instructions. Working with adult mentors, students have six weeks to design, build, program, and test their robots to meet the season's engineering challenge. 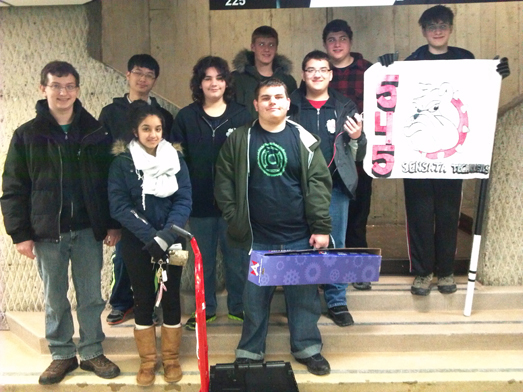 Once these young inventors build a robot, their teams will participate in the SBPLI Long Island Regional FIRST Robotics Competition, which will take place on March 27-29 at Hofstra University's David S. Mack Sports and Exhibition Complex. In addition, SBPLI held a special session for the students' parents in which they learned about the organization, its mission and the impact of the robotics programs on the students' lives, both academically and professionally. SBPLI representatives, team mentors, volunteers and former Long Island Regional FRC participants shared experiences and highlighted the value and importance of the robotics programs. An interactive session followed in which the parents provided suggestions for important fundraising activities and ways to reach other parents in the program. The FRC kickoff was hosted by Stony Brook University's College Of Engineering and Applied Sciences and sponsored by School-Business Partnerships of Long Island, Inc. (SBPLI), which has also sponsored the Long Island Regional FRC for the past fifteen years. "This proves to be an exciting time for the students and the mentors when they learn the name and the rules of the game for this year's FIRST Robotics Competition," said SBPLI Executive Director Joani Madarash. 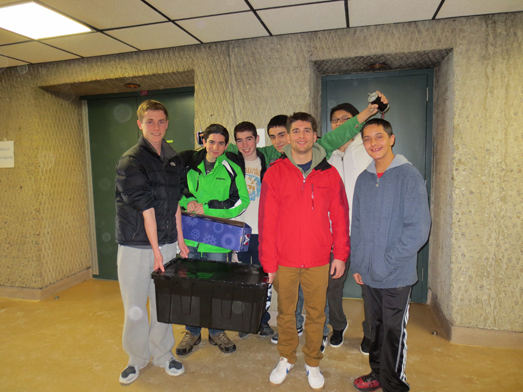 "We were very proud to present the FRC kickoff as we prepare for the upcoming Long Island Regional FRC in March." During the 2014 season, 49 teams from Long Island, New York City, the surrounding area and the Republic of Brazil will convene at Hofstra University for the Long Island Regional FRC on March 27-29, culminating with the 2014 FIRST Championship on April 24-27 at the Edward Jones Dome in St. Louis, Missouri. "The next six weeks will be crucial for these students as they design and construct their robots for this competition," said Ms. Madarash. "The Long Island Regional FIRST Robotics Competition showcases the talents of these students who learn not only the basic technological aspects of building their robots, but also about other concepts such as teamwork, problem solving and gracious professionalism."